For the second time in less than six months, Peter Berg and Mark Wahlberg have collaborated to recreate a “based on a true story” event that, at one point in recent history, dominated the news cycle for days on end. Deepwater Horizon, which was released on September 30, 2016, told the story of the disaster that sank a Gulf of Mexico oil-drilling rig. In it, Wahlberg played real-life survivor Mike Williams. In Patriots Day, the actor is once again front-and-center except, in this case, he plays a “composite” character. That’s a nice way of saying that Tommy Saunders isn’t a real person but was invented so the filmmakers would have someone they could insert into all of the key sequences without being accused of distorting the historical record. Berg’s chronicle of the 2013 Boston Marathon bombings and the subsequent manhunt is a first rate docudrama. For those who followed the events as they unfolded, there won’t be anything new here. It’s simply a cinematic re-enactment of things that happened beginning on April 15 and continued for several days after. Told from the perspective of (fictional) Boston cop Saunders (Wahlberg), the movie hits all the milestones although it perhaps tries too hard to be uplifting and inspirational. It also overreaches, attempting with little success to shoehorn the stories of several victims and other tangentially involved individuals into the proceedings. The final product is apparently the fusion of two separate scripts and it shows. The ending is odd - after the feature film is done, Berg provides us with a 7-minute documentary in which he shows interview clips with many of the real people involved in the incidents. As with all of Berg’s films, Patriots Day does an excellent job with sets and locales and is compulsively watchable. Two things limit its effectiveness. The first is that the story lacks a “freshness” factor. 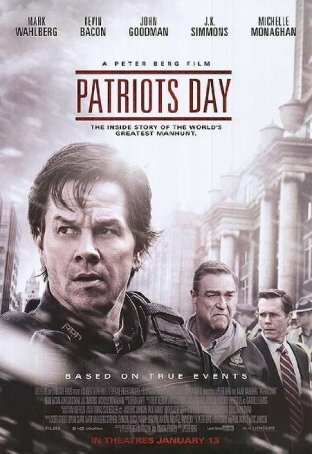 Even more so than Deepwater Horizon and Sully (two other recent, high-profile, “ripped from the headlines” movies), Patriots Day covers events that were exhaustively broadcast on TV as they were happening. There’s little more to learn about things than we already know and that gives a “been there, done that” quality to the proceedings. There’s never much tension because we know what’s going to happen next and how it’s all going to end. Secondly, the structure is unwieldy. Perhaps aware that the entire running length shouldn’t be devoted to the acts and observations of a person who doesn’t exist, Berg includes the stories of several victims and real-life cops who were involved in the search & capture mission. Most of these are ineffective due to time constraints and come across as filler. Especially unnecessary is a narrative surrounding Saunders’ wife, Carol, who serves no purpose beyond giving actress Michelle Monaghan screen time. Actors John Goodman (as Police Commissioner Ed Davis), Kevin Bacon (as FBI agent Richard DesLauriers), and J.K. Simmons (as Sgt. Jeffrey Pugliese) do good work in underwritten roles. One area where the screenplay effectively captures a side-story is in its handling of the Tsarnaev brothers, Dzhokhar (Alex Wolff) and Tamerlan (Themo Melikidze), along with Tamerlan’s wife, Katherine Russell (Melissa Benoist). Patriots Day provides the terrorists with motivations and shows how they followed the news coverage of their action before deciding on their next steps. This is arguably the most interesting element of Patriots Day because it’s one of the least-covered aspects of the story. We found out who the Tsarnaevs were during the manhunt but didn’t learn about their backgrounds until days (or weeks) later, when the story was no longer “hot” and therefore not worthy of front-page coverage. Berg was essentially a “director-for-hire” brought in mid-way through pre-production on Deepwater Horizon, but Patriots Day was his project from the start. Nevertheless, his involvement from inception to completion hasn’t resulted in an appreciably better motion picture. Both films are effective at what they intend to do. Patriots Day isn’t an Oscar contender nor does it offer much in the way of escapism but it’s not a bad way to spend a couple of hours - a far better prospect than what comes with most January time-wasters.